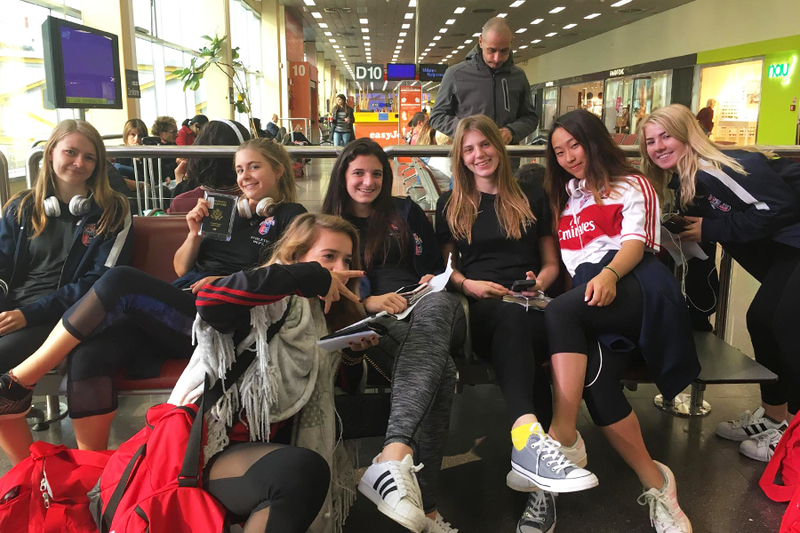 The Varsity Girls Soccer team traveled to Lisbon, Portugal, over the weekend of October 19–21 to compete in the European School Conference (ESC) Championship Tournament. Emma Dressler recaps the action below. 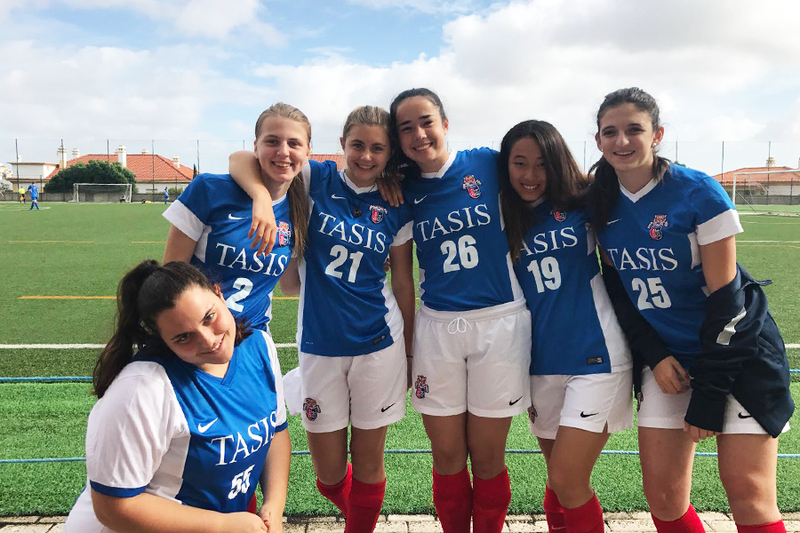 Just this past weekend, I traveled alongside the rest of the Varsity Girls Soccer Team to Lisbon, Portugal, where we competed in the European School Conference Championship Tournament hosted by Carlucci American International School of Lisbon (CAISL). After a short flight from Milan, we had a quick turnaround into our first game just a few hours after landing. The first game was against the home team, CAISL. The team that was anticipated to be arguably the toughest team of the bracket drew out a large crowd. Our team did well to hold off any successful shots during the first half, also keeping the ball in the opposing field for half the time. In the second half, however, a strong CAISL center midfielder got the first goal of the game, and the team would later add another goal. We were unable to get any balls on net this first day. After playing in this game, we headed to the houses of our host parents. We were all paired up with a teammate and assigned to a CAISL family whom we would live with that weekend. Fellow senior Zoe Ghilardi '18 and I bonded over Pizza Hut (which we have truly missed while in Switzerland) with our host family. 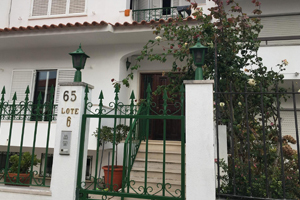 Afterwards, we went to the host family's home, a white Portuguese-style house. The parents did not speak English; however, the daughter spoke English at a very high level, and my roommate was surprised to hear that she too was in full IB and was taking many of the same higher levels as our friends. Even in a place so different to home there was common ground. Other girls on the team would later say that it was refreshing to have home-cooked meals, including pasta and burritos. Yulia Mochalnikova '19, a junior from Russia, had her first burrito while staying with an American family and told me that she tried to cut it with a fork and knife, which her host family along with her American teammates she was rooming with found very funny. Sisters Daisy Bachofen '20 and Autumn Bachofen '21 told me about how when the coach called for check-in, the host dad jokingly said, "The girls aren't here—they went clubbing," to which he then reassured our confused coach that he was only joking. The girls said they spent the next two hours talking and laughing with the host family. The next day we tied two games, the first against Valencia and the following against Milan. Despite the 0-0 scoreboards, there were some great attempts at putting the ball into the net. Penelope Baroni '21 had a great cross from the right corner of the box that was not finished, and in the last six minutes I was given a 30-yard free kick that landed in the left corner of the box but was just missed by one of our strikers. To these results, Coach Walker said, "We scored a point without scoring a goal." In the last game of the day we were able to connect properly and score a goal. 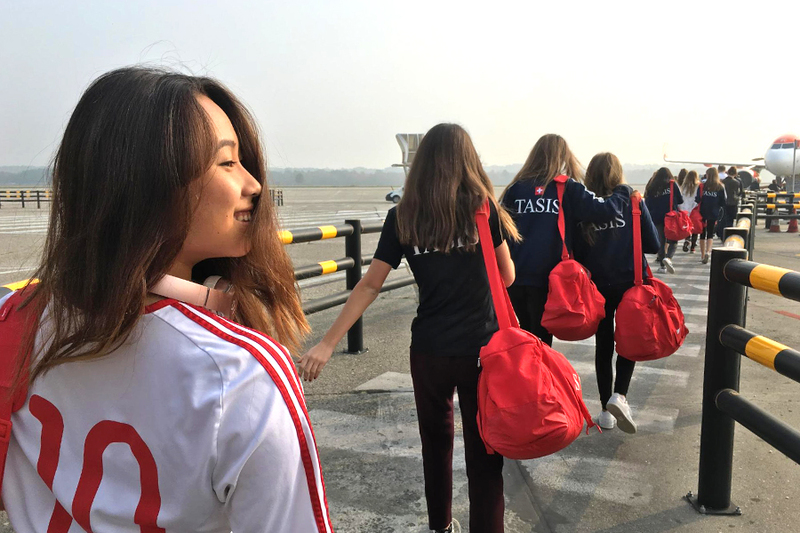 The goal came from Daisy Bachofen, our new transfer from The International School of Paris, a team that was also competing in the tournament. Daisy took advantage of a breakaway and pushed past the defense, depositing a shot into the left side of the netting. The team we faced, International School of Bavaria, later went on to win the entire tournament. That evening we went back to our same homestay families. 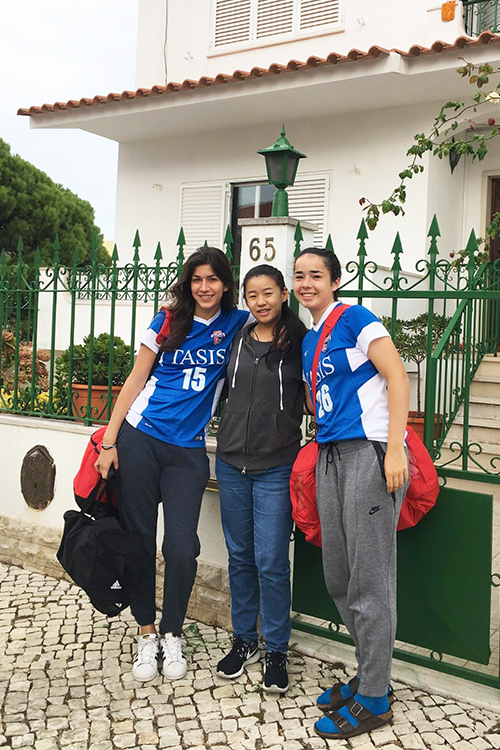 Desiree Wilkinson '20 and Airi Barnes '20 came back the next day and told us about how they went down to Baía de Cascais, or to our team, "The Beach." "It was really empty because it was too cold for people to swim, but we did anyways," said Airi. "I missed the beach." Her roommate Desiree particularly enjoyed the sushi that followed up this beach trip, telling me that they were offered six different trays of it. Daisy and Autumn Bachofen also enjoyed a night by the beach, as their host family took them out to pizza at a restaurant by the shore. After a long day (three games), Zoe and I stayed in for the night and ate noodles with eggs and tomato. We talked for hours with Mandy—the girl hosting us—about IB, soccer, and basketball. 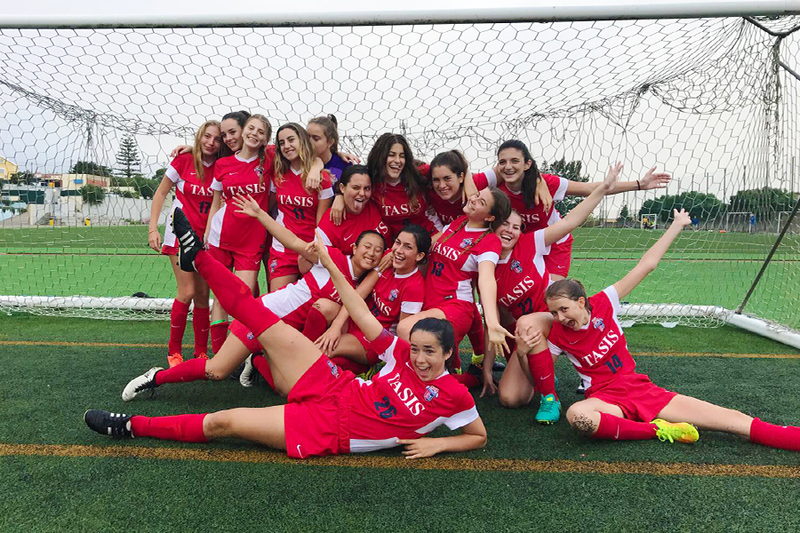 Once dinner was over the three of us even worked together on designing the TASIS soccer sweater that Zoe and I had been working on. On our last day in Lisbon, we faced off against St. Julian's, the defending champions of the tournament. We kicked things off with a great start, scoring a goal early on. Penelope Baroni sent another excellent cross over from the right side of the field to Airi Barnes, who later recalled finishing it just under the goalie's arm. After that the game really picked up the intensity as St. Julian's was determined to score a goal, but they were unable to do so. This gave us a continued streak of beating defending champions of this tournament. Two years ago, at the last TASIS visit to this tournament, we knocked out Berlin, who was the defending champion that year. This win locked down 7th place for us in a tough tournament. To this Coach Walker said, "We finally broke through and scored against this year's and last year's champions, which was a great way to end the tournament." We followed this up with the awards ceremony, in which one player from each team was named a member of the tournament's All-Star team. For TASIS this recognition went to our junior captain and center defender, Eve Ryan '19. An hour later, we were on our way to Lisbon Airport. We returned to Lugano at 2 AM the next morning—exhausted but happy to have had this experience as a team.